2. 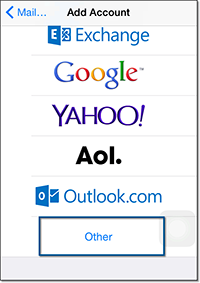 In your iPhone, Tap Settings >> Mail, Contacts and Calendar >> Add Account and choose Other. 4. If Two Factor Authentication is enabled for your account, provide Application Specific Password to configure the account. 5. 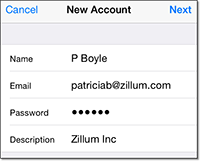 In the next screen, ensure that IMAP is selected in the top for account type. To configure your account as POP in your iPhone, refer here for configuration details to be used. 6. In the Incoming Mail Server section provide the details below. 7. In the Outgoing Mail Server section provide the details below. 8. The device connects to the IMAP server and authenticates the credentials provided by you. 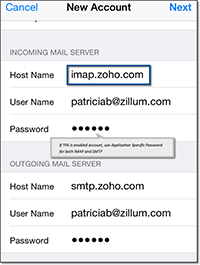 On successful authentication, the IMAP account is set up in your mobile device. Having troubles? Check out the troubleshooting information on Zoho's website here.